Ken Burns DipMus(Hons)Madrid, Full MTA member, accredited teacher. Ken was born in Hill End (Country NSW) in 1946. He was drawn to the early recordings of south American guitarists Rey de la Torre, Alirio Diaz and the Flamenco recordings of Sabicas and Carmen Amaya. He took the guitar up initially without formal tuition. In 1963 Ken seized an opportunity for tuition with Jose Luis Gonzales in Sydney. Jose Luis Gonzales, a prodigy of the guitar and protege of Andres Segovia was appointed to Sydney at the request of the Sydney Classical Guitar Society who were seeking a suitably qualified master of the guitar; to establish a school for the classical guitar, to undertake concert performances, and to generally elevate the status of the classical guitar in Australia. Ken commenced studies with Jose Luis Gonzales at the studios of Recordi Music Publishing and later with Antonio Losada among the first Australian students to be formally trained by an international artist. It was a three day return bus trips from Hill End to attend these classes in Sydney. Ken's commitment and passion payed off; his technical understanding and capability developed immensely over this period culminating in 1967 where he competed in the Sydney Eisteddfod and was awarded first prize. Ever keen to develop his knowledge of guitar, he travelled to Melbourne in 1971 to attend a Master Class with Alirio Diaz (a Venezuelan guitarist). He came to the realisation that if he was to further develop his command of the classical guitar he would need to go to Spain; to expose himself to a broader range of teachers, knowledge and repertoire that was unavailable to him in Australia at that time. In 1972 he embarked for Spain and commenced his studies at the Conservatorium of Madrid. He regularly attended Master Classes with Andre Segovia, Jose Tomas, Jose Luis Rodrigo as well as Jose Luis Gonzales in Santiago de Compostela, Alicante and Madrid. He completed his formal training in 1977 graduating with 'Distinction' from the Curso Superior of the Conservatorium of Madrid. He gave recitals in Spain and made recordings for the Spanish National Radio. Having developed a thorough understanding of guitar technique he returned to Australia and was appointed to the Sydney Conservatorium of Music as one of Australia's first formally trained tertiary level guitar teachers. He taught there from 1978 to 1998 and developed a reputation amongst Sydney’s guitar fraternity as one of Australia’s finest guitar teachers. 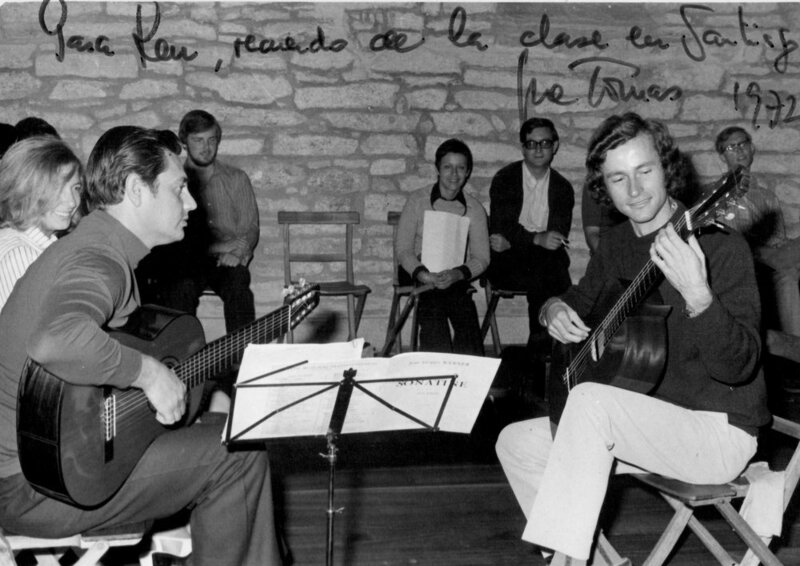 In 1980 Ken founded the Sydney Classical Guitar Summer School which runs to this day, now under the direction of the Sydney Classical Guitar Society. He was its director from 1980 to 1986. The Summer School provides an opportunity for ensemble repertoire and Masterclasses from visiting and resident artists. In 1985 he commissioned several works by Richard Charlton (Australian Guitar Composer) which were performed by Guitar Ensembles at the Sydney Summer School. Ken was the appointed Director of Australia’s first national classical guitar competition from 1987 to 1992. The Australian Guitar Competition was established In 1982 with funding from the Hispanic Foundation of Australia. Ken’s mission for the competition was "not really just to applaud or sponsor the winners, but to make more Australians aware of the great guitar talent we have in this country". He was mindful that classical guitar in Australia was dominated by Spanish and Latin American influences. Ken understood that "... eventually we will create a very distinctive, very Australian way of playing guitar and the competition is one way of getting the process started". With the assistance of the Australia Council Ken commissioned works by Richard Vella and Michael Whitticker for solo performance. Copies of these works are held by the Australian Music Library. In 1988 he edited and compiled tuition books for junior guitarists to establish suitable repertoire for young guitarists. Ken has given recitals in New South Wales, Victoria and Western Australia, and has conducted Summer Schools for the NSW Arts Council, Workers Educational and the Western Australian College of the Arts. In 1998 just short of 20 years at the Sydney Conservatorium of Music he decided to focus on his own teaching studios. He currently undertakes tuition from his private studio in Sutherland, at the Kirribilli Community Centre and from the music department of one Sydney’s leading private schools. Ken has taught several of Australia’s most accomplished guitarists, and a current generation of guitar teachers who are honoured to credit him as their teacher.